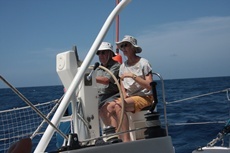 We arrived in Dominica for a late lunch, John and Chris (s/y Oriole) joined us and as we are very stable. It was a well received invite to be able to leave the rock and roll of Oriole. Given the roly state of their boat they stayed for the rest of the afternoon. After a comfortable night for us and a sleepless one for the monohull brigade we headed inland to visit real life in Portsmouth, Dominica. It's not a wealthy place but it's a friendly one. Everyone greets you, but no-one hassled us. The kids were particularly fascinated with this tree house/home on the beach. 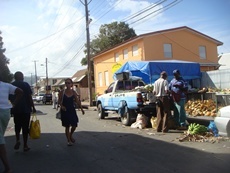 Visited a very real local market to collect provisions. We have been particularly disappointed with the fresh fruit and veg in the carribean until recently all the northern Islands seem to rely on imports from the US or Europe. 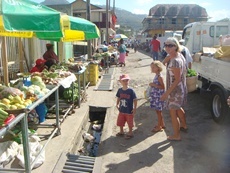 New we are here and Dominica is known as the Fruit Basket of the Caribean all the supplies are delicious local and fresh. 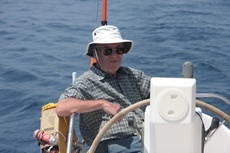 By the afternoon the swell and wind is really getting up and so the planned trip up the Indian river is reduced to the Price clan, whilst the Liytles keep watch. Martin, owner of the boat Providence, picked us up and took us on a lovely trip up Indian river. This slowly meandering river is entered from behind a hurrcane wrecked freighter. 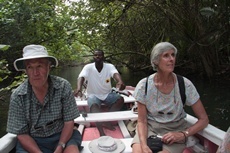 Martin rowed up the river passed mangroves, palms and crabs. Kids lay on the bow being pretty good, and even better once they had huge lollypops. Granny and Papa together in front of Martin. We passed by a tight bend in the river where a scene from 'Pirates of the Caribbean II' was shot. We looked in awe at the place where Leonardo must have stood. 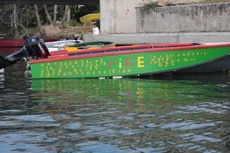 There have been many references to these films around Dominica and Martinique, much to Liz's ire Colin is becoming a swarthy pirate, "savy". Anyway, I digress. At the top of indian river we got out to see the ubiquitous cafe and walked up a little further for the kids to have a wash in the cool river. 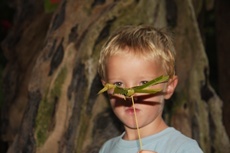 Back at the cafe, and along with a rum punch, Martin made birds from folded bamboo. Sadly our time is a little pressed and we need to get down to meet up with our next guests, but Dominica looks like a lovely lush place. It's a shame we haven't more time to hang-out we think a least a week would be a good time to spend here. The Government have even made it easy to check in and out unlike a lot of other Islands. 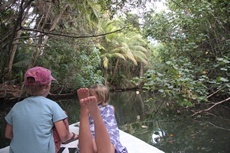 It has real rainforest to explore, much more so than all other Caribbean islands. 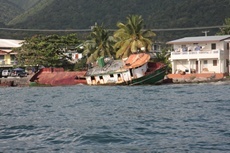 The more we think about it the more we would love to have spent more time, and return to Dominica. It is so what the Caribbean should be about. 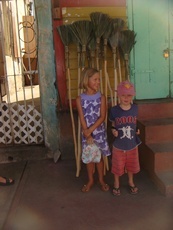 Well, we didn't mean to come here, but there we were and we liked it ..... On to Martinique next to pick up the Saunders.